Oh my, the desserts! If there's one thing that southern cooks excel at, it's incredible homemade desserts! Do you remember the delicious cakes, pies, and cobblers that your mother and grandmother used to make? And fresh baked pies and cobblers like Buttermilk, Chess, or an incredible Vinegar Pie. Or maybe a Creamy Pumpkin Pie, Brown Sugar Pie, or any number of fresh fruit cobblers like Blackberry, Blueberry, or Strawberry. Have you ever had Peach, Blueberry, or Strawberry Dumplings? These are so good they will almost make a grown man cry. Do you remember waking up to fresh, hot "Cat Head Biscuits" smothered in real Southern Chocolate Gravy? This is a child's and chocolate lover's dream come true! "Cat Head Biscuits" - 180 hand picked, family tried and tested, real southern recipes. Everything from traditional meat and vegetable dishes to homemade desserts so good, they will almost make a grown man cry. Not an expert cook? No problem! These are recipes for real food. All of the recipes in this cookbook are simple to prepare using everyday ingredients that are readily available. "Cat Head Biscuits" is more than just a cookbook. 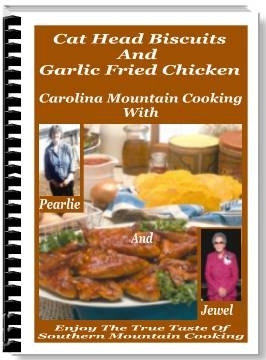 Along with these wonderful real home cooked recipes it also contains humorous and entertaining glimpses into life growing up here in the Blue Ridge Mountains of North Carolina.